Mitsubishi brings stylish Mitsubishi Lancer GT 2016 which is a compact sedan with a number of key design and feature improvements to set it apart from the pack. It is a sports oriented model in the lineup which includes Lancer ES and SE. The SEL joins the family as an upper-midlevel edition, slotted between the lower-midlevel SE and the sport-oriented GT. 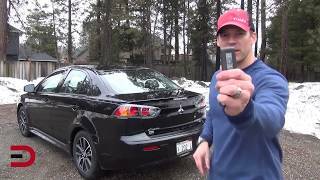 Let us have a close look the reviews of the stylish Mitsubishi Lancer GT 2016 and get to know more about the gestures it contains. The Mitsubishi Lancer GT 2016 interior is designed with great features. It includes, a redesigned center console, improved display audio system, display screen and upgraded seat fabrics. The model is solely offered with FWD. The performance-oriented GT is also including features like climate control and Rockford Fosgate premium audio with 750 watts and 9 Surround Sound speakers. Various options available across the Lancer lineup include remote engine start, LED interior lighting, and upgraded interior accent materials. Higher trims also offer GPS navigation. Standard safety features aboard all 2016 Lancer variations include 4-wheel anti lock brakes (ABS), with the FWD ES equipped with a front disc and rear drum setup, while all other trims boast front and rear disc brakes. The exterior of Mitsubishi Lancer GT 2016 is generous and sportier. The 2016 Lancer features a fresh and bold new signature design for the front fascia/grille section. Lancer GT 2016 offers a new front fascia, a redesigned center console, and 2 new color choices, Diamond White Pearl and Alloy Silver. The GT also offers the sporting 18-inch alloy wheels. There are new LED daytime running lights (DRLs), and a new chrome beltline trim. It wears Final Edition badging, a black painted aluminum roof, a gloss-black center bumper and hood air outlet, dark chrome painted alloy wheels and grille surround, bi-xenon high-intensity-discharge headlights. All these features add the looks in the sportier Lancer GT.